The death of the Lord Jesus Christ is a subject of never-failing interest to all who study prayerfully the Scripture of Truth. This is so not only because the believer's all, both for time and eternity, depends upon it, but also because of its transcendent uniqueness. Four words appear to sum up the salient features of this mystery of mysteries: the death of Christ was natural, unnatural, preternatural, and supernatural. A few comments seem called for by way of definition and amplification. First, the death of Christ was natural. By this we mean that it was a real death. It is because we are so familiar with the fact of it that the above statement appears simple and commonplace, yet what we here touch upon is to the spiritual mind one of the main elements of wonderment. The One who was "taken, and by wicked hands" crucified and slain was none less than Immanuel (Act 2:23). The One who died on Calvary's Cross was none other than Jehovah's "fellow" (Zechariah 13:7). The blood that was shed on the accursed tree was divine—"The church of God which he purchased with his own blood" (Act 20:28). As says the apostle, "God was in Christ, reconciling the world unto himself" (2 Corinthians 5:19). But how could Jehovah's "fellow" suffer? How could the eternal One die? Ah, He who in the beginning was the Word, who was with God, and who was God, "became flesh." He who was in the form of God took upon Him the form of a servant and was made in the likeness of men; "and being found in fashion as a man, he humbled himself, and became obedient unto death, even the death of the cross" (Phi 2:8). Thus having become incarnate, the Lord of glory was capable of suffering death, and so it was that He "tasted" death itself. In His words, "Father, into your hands I commend my spirit," we see how natural His death was. The reality of it became still more apparent when He was laid in the tomb, where He remained for three days. Second, the death of Christ was un-natural. By this we mean that it was abnormal. Above we have said that in becoming incarnate, the Son of God became capable of suffering death. Yet it must not be inferred from this that death therefore had a claim upon Him; far from this being the case, the very reverse was the truth. Death is the wages of sin, and He had none. Before His birth it was said to Mary, "that holy thing which shall be born of you shall be called the Son of God" (Luke 1:35). Not only did the Lord Jesus enter this world without contracting the defilement attaching to fallen human nature, but He "did no sin" (1 Peter 2:22), had "no sin" (1 John 3:5), "knew no sin" (2 Corinthians 5:21). In His person and in His conduct He was the Holy One of God "without blemish and without spot" (1 Peter 1:19). As such, death had no claim upon Him. Even Pilate had to acknowledge that he could find in Him "no fault." Hence we say, for the Holy One of God to die was un-natural. Third, the death of Christ was preternatural. By this we mean that it was marked out and determined for Him beforehand. He was the Lamb slain from the foundation of the world (Rev 13:8). Before Adam was created, the Fall was anticipated. Before sin entered the world, salvation from it had been planned by God. In the eternal counsels of Deity, it was fore-ordained that there should be a Savior for sinners, a Savior Who should suffer, the Just for the unjust, a Savior Who should die in order that we might live. And "because there was none other good enough to pay the price for sin," the only-Begotten of the Father offered Himself as the Ransom. The preternatural character of the death of Christ has been well termed the "undergirding of the Cross." It was in view of that approaching death that God "justly passed over the sins done aforetime" (Rom 3:25 R.V.) Had not Christ been, in the reckoning of God, the Lamb slain from the foundation of the world, every sinning person in the Old Testament times would have gone down to the Pit the moment he sinned! Fourth, the death of Christ was supernatural. By this we mean that it was different from every other death. In all things He has the pre-eminence. His birth was different from all other births. His life was different from all other lives. And His death was different from all other deaths. This was clearly intimated in His own utterance upon the subject—"Therefore does my Father love me, because I lay down my life, that I might take it again. No man takes it from me, but I lay it down of myself. I have power…to take it again" (John 10:17-18). 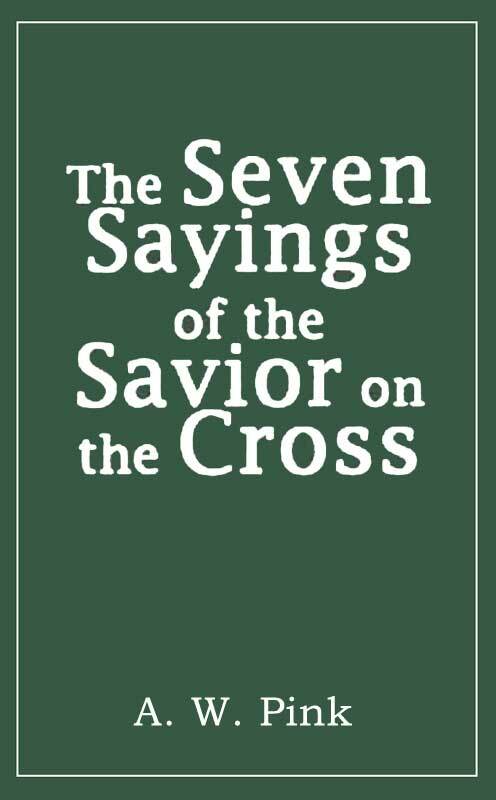 A careful study of the Gospel narratives which describe His death furnish a sevenfold proof and verification of His assertion. (1) That our Lord "laid down his life," that He was not powerless in the hands of His enemies, comes out clearly in John 18, where we have the record of His arrest. A band of officers from the chief priests and Pharisees, headed by Judas, sought Him in Gethsemane. Coming forward to meet them, the Lord Jesus asks, "Whom seek you?" The reply was, "Jesus of Nazareth," and then our Lord uttered the ineffable title of deity, that by which Jehovah had revealed Himself of old to Moses at the burning bush—"I AM." The effect was startling. We are told "they went backward, and fell to the ground." These officers were awestruck. They were in the presence of incarnate Deity and were overpowered by a brief consciousness of divine majesty. How plain it is then that had He so pleased, our blessed Savior could have walked quietly away, leaving those who had come to arrest Him prostrate on the ground! Instead, He delivers Himself up into their hands and is led (not driven) as a lamb to the slaughter. (2) Let us now turn to Matthew 27:46—the most solemn verse in all the Bible—"And about the ninth hour Jesus cried with a loud voice, saying, Eli, Eli, lama, sabachthani? that is to say, My God, my God, why have you forsaken me?" The words which we would ask the reader to observe carefully are here placed in italics. Why is it that the Holy Spirit tells us that the Savior uttered that terrible cry "with a loud voice"? Most certainly there is a reason for it. This becomes even more apparent when we note that He has repeated them four verses lower down in the same chapter—"Jesus, when he had cried again with a loud voice, yielded up the spirit" (Mat 27:50). What then do these words indicate? Do they not corroborate what has been said in the above paragraphs? Do they not tell us that the Savior was not exhausted by what He had passed through? Do they not intimate that His strength had not failed Him? that He was still master of Himself, that instead of being conquered by death, He was but yielding Himself to it? Do they not show us that God had "laid help upon one that was mighty" (Psalm 89:19)! (3) We call attention next to His fourth utterance on the Cross—"I thirst." This word, in the light of its setting, furnishes a wonderful evidence of our Lord's complete self-possession. The whole verse reads as follows: "After this, Jesus knowing that all things were now accomplished, that the scripture might be fulfilled, said, I thirst" (John 19:28). Of old it had been predicted that they should give the Savior to drink vinegar mingled with gall. And in order that this prophecy might be fulfilled, He cried, "I thirst." How this evidences the fact that He was in full possession of His mental faculties, that His mind was unclouded, that His terrible sufferings had neither deranged nor disturbed it. As He hung on the Cross, at the close of the six hours, His mind reviewed the entire scope of the prophetic word, and checked off one by one those predictions which had reference to His passion. Excepting the prophecies which were to be fulfilled after His death, but one remained un-fulfilled, namely, "They gave me also gall for my meat; and in my thirst they gave me vinegar to drink" (Psalm 69:21), and this was not overlooked by the blessed Sufferer. "Jesus knowing that all things were now accomplished, that the scripture [not "scriptures," the reference being to Psalm 69:21] might be fulfilled, says, I thirst." Again, we say, what proof is here furnished that He "laid down his life" of Himself (1 John 3:16)! (4) The next verification the Holy Spirit has supplied of our Lord's words in John 10:18 is found in John 19:30—"When Jesus had received the vinegar, he said, It is finished; and he bowed his head, and gave up the spirit." What are we intended to learn from these words? What is here signified by this act of the Savior? Surely the answer is not far to seek. The implication is clear. Previous to this our Lord's head had been held erect. It was no impotent sufferer that hung there in a swoon. Had that been the case His head had lolled helplessly on His chest, and it would have been impossible for Him to "bow" it. And mark attentively the verb used here: it is not His head "fell," but He—consciously, calmly, reverently—bowed His head. How sublime was His carriage even on the tree! What superb composure did He evidence. Was it not His majestic bearing on the Cross that, among other things, caused the centurion to cry "Truly this was the son of God" (Mat 27:54)! (5) Look now at His last act of all: "And when Jesus had cried with a loud voice, he said, Father, into your hands I commend my spirit: and having said this, he gave up the spirit" (Luke 23:46). None else ever did this or died thus. How accurately these words agree with His own statement, so often quoted by us, "I lay down my life, that I might take it again. No man takes it from me, but I lay it down of myself "(John 10:17-18). The uniqueness of our Lord's action may be seen by comparing His words on the Cross with those of dying Stephen. As the first Christian martyr came to the brink of the river, he cried, "Lord Jesus, receive my spirit" (Act 7:59). But in contrast with this, Christ said, "Father into your hands I commend my spirit." Stephen's spirit was being taken from him. Not so with the Savior. None could take from Him His life. He "gave up" His spirit. (6) The action of the soldiers in regard to the legs of those on the three crosses gives further evidence of the uniqueness of Christ's death. We read, "The Jews therefore, because it was the preparation, that the bodies should not remain upon the Cross on the Sabbath day, (for that Sabbath day was an high day), besought Pilate that their legs might be broken, and that they might be taken away. Then came the soldiers, and brake the legs of the first, and of the other which was crucified with him. But when they came to Jesus, and saw that he was dead already, they brake not his legs" (John 19:31-33). The Lord Jesus and the two thieves had been crucified together. They had been on their respective crosses the same length of time. And now at the close of the day the two thieves were still alive, for as it is well known that death by crucifixion, though exceedingly painful, was usually a slow death. No vital member of the body was directly affected, and often the sufferer lingered on for two or three days before being completely overcome by exhaustion. 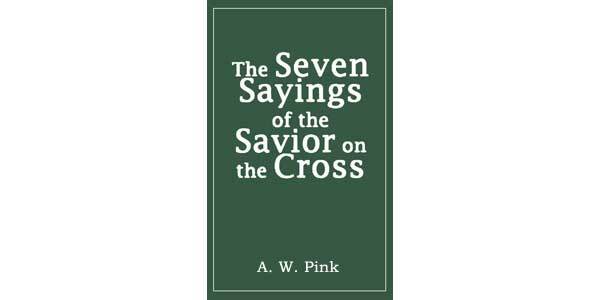 It was not natural, therefore, that Christ should be dead after but six hours on the Cross. The Jews recognized this, and requested Pilate that the legs of all three be broken and death thus be hastened. In the fact, then, that the Savior was "dead already" when the soldiers came to Him, though the two thieves yet lived, we have additional proof that He had voluntarily "laid down his life" of Himself, that it was not "taken from him." (7) For the final demonstration of the super-natural character of Christ's death we turn to note the wonderful phenomena that accompanied it, "And, behold, the veil of the temple was rent in twain from the top to the bottom; and the earth did quake, and the rocks rent; and the graves were opened" (Mat 27:51-52). That was no ordinary death that had been witnessed on the summit of Golgotha's rugged heights, and it was followed by no ordinary attendants. First, the veil of the temple was rent in twain from top to bottom, to show that a Hand from Heaven had torn asunder that curtain which shut out the temple-worshiper from the earthly throne of God—thus signifying that the way into the Holiest was now made plain and that access to God Himself had been opened up through the broken body of His Son. Next, the earth did quake. Not, I believe, that there was an earthquake, nor even a "great earthquake," but the earth itself, the entire earth was shaken to its very foundation, and rocked on its axis, as though to show it was horrified at the most awful deed that had ever been perpetrated on its surface. "And the rocks rent"—the very strength of nature gave way before the greater power of that death. Finally, we are told, "the graves were opened," showing that the power of Satan, which is death, was there shivered and shattered—all the outward attestations of the value of that atoning death. Putting these together: the manifest yielding up of Himself into the hands of those who arrested Him; the crying with a "loud voice," denoting His retained vigor; the fact that He was in full and unimpaired possession of His mentality, evidenced by the "knowing that all things were now accomplished"; the "bowing" of the erect head; the deliberate "committing" of His spirit into the hands of the Father; the fact that He was "dead already" when the soldiers came to brake His legs—all furnished proof that His life was not taken from Him, but that He laid it down of Himself. This, together with the tearing of the temple veil, the quaking of the earth, the rending of the rocks, and the opening of the graves, all bore unmistakable witness to the supernatural character of His death; in view of which we may well say with the wondering centurion, "Truly this was the son of God" (Mat 27:54). The death of Christ, then, was unique, miraculous, supernatural. In the chapters which follow we shall hearken to the words which fell from His lips while He hung upon the Cross—words which make known to us some of the attendant circumstances of the great tragedy; words which reveal the excellencies of the One who suffered there; words in which is wrapped up the Gospel of our salvation; and words which inform us of the purpose, the meaning, the sufferings, and the sufficiency of the death divine.